"The demands of justice must first of all be satisfied; that which is already due in justice is not to be offered as a gift of charity." Thanks to you for raising your voice, light is finally shining at the root of horrific violence in the Congo. Catholic Relief Services (CRS) and the United States Conference of Catholic Bishops (USCCB) welcome the long-awaited announcement of regulations that require companies to report whether they obtain any of four minerals from the Democratic Republic of Congo (DRC) and what they do to track the source and chain of custody of those minerals. These regulations are essential for protecting innocent civilians from violent militias funded by illicit mining operations. The Congo Conflict Minerals Act (Section 1502 of the Dodd-Frank Wall Street Reform and Consumer Protection Act) was passed by Congress and signed into law in 2010. The rules implementing this section were supposed to be published by the Securities and Exchange Commission (SEC) in April 2011, but have been delayed until now largely due to opposition from some in the industry. Upon initial review, CRS and USCCB are very disappointed that it appears that the regulations will allow companies to describe the origin of their minerals as ‘undeterminable’ for up to four years. We are still reviewing the details of these complex regulations and may raise concerns about specific aspects, but remain optimistic that moving forward with their implementation will help to address the brutal war raging in the eastern DRC. The deadliest conflict since World War II, this war has been funded and fueled by the trade in tin, tantalum, tungsten, and gold, four minerals commonly used in products such as cell phones, laptop computers and jewelry. Since 1998, the violence in the eastern DRC has left millions of people dead and countless others victims of an epidemic of sexual and gender-based violence. Child labor and modern forms of slavery are also prevalent in the mines. CRS and USCCB echo the sentiments expressed by Bishop Nicolas Djomo Lola, Bishop of the Diocese of Tshumbe and President of the Catholic Bishops' Conference of the Congo in May 2012 congressional testimony: “The people of the Congo saw [The Congo Conflict Minerals Provisions of Section 1502 of the Dodd-Frank Act] as a true expression of solidarity with the women, families and villages who have suffered at the hands of those who destroy our communities to mine our resources. Improvements in transparency of the minerals trade in the Eastern Congo are happening largely because of the legislation that you passed in these hallowed halls. It is our hope that the rules that the SEC will establish will live up to the laudable goals of this provision in the Dodd-Frank Act.” We hope that upon further study this will indeed be the case. We will be in touch with more analysis in the coming days, but in the meantime thank you for your prayers and advocacy on behalf of the people of Congo! Your efforts are making a difference and we are one step closer to achieving peace and justice for our Congolese brothers and sisters. Please read Catholic Relief Services Summer Quarterly Update under the JPIC tab. 4. Justice for Immigrants: We are one family under God! 10.National Committee for a Human Life Amendment, Inc.
For December, the Spotlight Program is: "The Respect Life Campaign"
Take Action: Go to the "Action Alerts" tab on the NCHLA website and click on "Send an email to Congress" to support the "Keep Conscience Protection in Omnibus Appropriation Bill." As stated on their website, "The House version of the Fiscal Year 2012 Labor/Health and Human Services Appropriations Bill (not numbered) contains the Abortion Non-Discrimination Act ANDA). It is critical that this conscience protection bill remains a part of the omnibus appropriations bill now being considered by Congress. ANDA strengthens existing federal conscience protection laws and affirms the principle that no health care entity should be forced by government to perform or participate in abortions." For Pro-Life Events Across America, please click here. On January 20, 2012 the U. S. Department of Health and Human Services reaffirmed a rule forcing nearly all private health plans to include coverage for all FDA-approved prescription contraceptive drugs and devices, as well as surgical sterilization. These are listed among "preventive services for women" that all health plans will have to cover without co-pays or other cost-sharing -- regardless of whether the insurer, the employer or other plan sponsor, or even the woman herself objects to such coverage. The exemption provided for "religious employers" is so narrow that it fails to cover the vast majority of faith-based organizations, including Catholic hospitals, universities, and service organizations that help millions every year. As stated on the NCHLA's website: "The rule is set to take effect August 1, 2012. Non-profit religious employers that do not now provide such coverage, and are not exempt under the rule’s extremely narrow definition of religious employer, will be given one year—to August 1, 2013— to comply. Those religious employers who would qualify under the narrow exemption would be required to notify employees of their policy and provide information where the services can be obtained." "It is more important than ever that Members of Congress be urged to co-sponsor the Respect for Rights of Conscience Act." Write to Congress (Click Here) . The fight for conscience rights is multi-faceted. Federal rule-making is only one part. Our country's longstanding laws protecting conscience rights must now apply fully to the implementation of health care reform. For that we need a law. Please read the USCCB's response to HHS' decision and learn more about conscience protection through USCCB resources. "CATHOLIC MOBILIZING NETWORK TO END THE USE OF THE DEATH PENALTY"
· Educate the lay community through our programs and materials on the Church’s teachings on the death penalty. · Facilitate respectful and informed discourse within the Catholic community and the community at large. The Catholic Mobilizing Network encourages its members and others to pray for the persons listed on their website (http://catholicsmobilizing.org/), their families, their victims, their victims' families, and for those carrying out the executions in our names. State organizations and concerned individuals may wish to consider organizing for actions associated with upcoming executions in their states. To begin this process, visit your state’s page on their website and reach out to the anti-death penalty organizations in your state. On their website you will find pastoral statements from various Bishops and the Vatican under the “Mission” tab. Under the “Programs” and “Curriculum,” tabs, there is a list of speakers, as well as, educational curriculum for teaching the Church’s position opposing the use of the death penalty for audiences ranging from junior high students to adults. Our Franciscan Mission Statement for Justice, Peace, and Integrity of Creation states that we "respect all created things as brothers and sisters of penance, bringing life to the Gospel and Gospel to Life." Within the JPIC goals, we are called to "respond to anything that would denigrate the dignity of the human person." 1998 Pacem In Terris Award Winner, Sister Helen Prejean’s ministry captured in the book and movie, Dead Man Walking, speaks to the need for healing and reconciliation including those on death row. Check out CMN's January Monthly Newsletter and CMN's Archived Newsletters. For February, the Spotlight Program is: "Justice for Immigrants--We are one family under God!" From the Justice for Immigrants website: “In June 2004, the United States Conference of Catholic Bishops Committee on Migration and The Catholic Legal Immigration Network, INC. (CLINIC) Board of Directors resolved to make comprehensive immigration reform, with special emphasis on legalization, a major public policy priority within the Church. Many other national Catholic institutions have also made legalization a policy priority. States Conference of Catholic Bishops' Justice for Immigrants: A Journey of Hope campaign designed to unite and mobilize a growing network of Catholic institutions, individuals, and other persons of good faith in support of a broad legalization program and comprehensive immigration reform. Its goal will be to maximize the Church's influence on this issue, consistent with the immigration reform principles enunciated in the bishops' pastoral letter. For March, the Spotlight Program is: "Interfaith Worker Justice"
From the United States Conference of Catholic Bishops: “Working in collaboration with Interfaith Worker Justice and other faith-based groups, the Bishops’ Committee on Domestic Justice and Human Development is intensifying its efforts to support our unemployed brother and sisters, and their families. 1. Advocate policies that protect families and ensure access to just and decent jobs with fair wages. Please read, "Economic Justice for All a Catholic Framework for Economic Life," from the USCCB. Here is a link to an article written by Anne Marie Amacher published in "The Catholic Messenger" called, "Workers Defense Project helps low-income employees." For April, the Spotlight Program is: "Catholic Climate Covenant--Care for Creation, Care for the Poor"
To learn about the Catholic Climate Covenant, please visit their website. So far, 6,641 people have taken this pledge. Creator of Water, help us who follow St. Francis to value your precious gift, which nourishes, refreshes, invigorates and cleanses us. Creator of Water, grant all of our brothers and sisters of the human family to respect this life-giving element and use it with gratitude. Creator of Water, help those who suffer from drought and its consequences to receive aid from those of us who have water and good harvests in abundance. Creator of Water, grant that the nations of the earth may see the oceans as a common heritage of human-kind and not alone for those powerful enough to exploit it. Creator of Water, give the leaders of the world the enlightenment to arrive at a Law of the Seas, which will further justice in the use of the wealth contained in the earth's oceans. Creator of Water, raise up prophets in the powerful nations who will speak against using the seas as potential battlegrounds and places of destruction. Creator of Water, help us as a nation to return to the founding principles on which rest our society – principles of liberation and justice for all, especially in relation to water and its use. Creator of Water, make of us Franciscans living in the United States today true instruments of your Peace in the matter of water and its use. Creator of Water, help us American Franciscans to see our part in bringing about a consciousness of the injustices surrounding the use of this most precious gift. Creator of Water, enlighten us American Franciscans to know what we can do to foster Justice in our country and our world so that Sister Water may again be a gift for all humankind. Amen." For May, the Spotlight Program is: "National Catholic Rural Life Conference." From the NCRLC website: “Our mission is to apply the teachings of Jesus Christ for the social, economic, and spiritual development of rural America with responsibility for the care of God's creation. By providing spiritual, educational and advocacy assistance, NCRLC helps rural people shape their futures and lead lives of dignity. Reduce agricultural subsidies and direct payments to farmers overall and target subsidies to small and moderate-sized farms, especially minority-owned farms. Take Action: Tell your senators to support a fair Farm Bill Today! 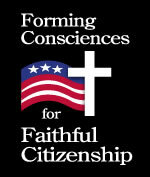 For June, the Spotlight Program is: "Forming Consciences for Faithful Citizenship." Why concern ourselves with Faithful Citizenship? Responsible citizenship speaks to the goals of JPIC, including reinforcing the appreciation of the dignity of the human person, living out of obedience to the common good and strengthening our commitment to solidarity with all of creation. Faithful Citizenship is NOT a voter’s guide, it is instead a guide to help Catholics become informed as to how forming a conscience based on our faith can shape our social and political lives. Why pursue information via the USCCB website or from Franciscan Media? The reality is a very small number of Catholics know of Faithful Citizenship, which is incredibly unfortunate. For August, the Spotlight Program is: "The USCCB's Domestic Anti-Poverty Campaign." CCHD is the domestic anti-poverty program of the U.S. Catholic Bishops and works to break the cycle of poverty by helping low-income people participate in decisions that affect their lives, families and communities. CCHD offers a hand up, not a hand out. It has a complementary mission of educating on poverty and its causes. This dual pastoral strategy of education for justice and helping people who are poor speak and act for themselves reflects the mandate of the Scriptures and the principles of Catholic social teaching. In preparation for this update, I consulted with folks on the JPIC Commission about their knowledge of CCHD grant projects. Educate parishioners about poverty in Maine and in the U.S. and equip them to work for change through transformative education. Fund groups in the diocese who are working to end poverty. We fund groups through the donations you make to the CCHD collection, which takes place at your parish, annually, the weekend before Thanksgiving. CCHD monies have been used to fund many organizations in Maine who work to create systemic changes and empower the poor to be the voice for change in their communities. Since 100% of the money comes from the Catholic community, education and support to parishes is important to the advisory committee. In 2010, we were approached by a parish priest for funding support in rebuilding relationships in the faith community. CCHD provide funding to the Kennebec Valley Organization to work with the local priest to help train and build leaders using the organizing model of 1-to1 dialogues. In Maine Priest often serve in a parish with multiple worship sites and large geographical areas. Supporting faith-based organizing models CCHD funded groups work with congregations to build their capacity to develop lay leadership, to create strong relational networks within the congregation and community, and to effectively engage in the public square around CCHD's mission of reducing poverty and promoting the dignity of all. My own experience with CCHD funded programs is based on my work as a Diocesan Director of Social Action. Three years ago, I visited a program in New Jersey. The program was comprised of concerned parents of school children who were being exposed to unhealthy lead levels in the school water. With the help of a national CCHD grant, the parents were able to organize, and in turn have a stronger voice to the school board in order to affect change. Within our Diocese here in Iowa, I watch with great admiration the work of Quad Cities Interfaith, who work on a variety of justice issues include a transportation task force whose focus is to make sure minorities and underrepresented groups are part of the jobs that will be created with an expansion of a commuter rail line from Chicago. We have also seen strong efforts with a local CCHD grant by a group, Clean Air Muscatine or CLAM. CLAM is working with folks living in poverty who have been adversely affected by air quality that isn’t meeting EPA standards, which results in high rates of juvenile asthma and other medical difficulties for vulnerable populations and the general public.